The word "nebula" is derived from the Latin word for "clouds". Indeed, a nebula is a cosmic cloud of gas and dust floating in space. More than one nebula are called nebulae. Nebulae are the basic building blocks of the universe. They contain the elements from which stars and solar systems are built. They are also among the most beautiful objects in the universe, glowing with rich colors and swirls of light. Stars inside these clouds of gas cause them to glow with beautiful reds, blues, and greens. These colors are the result of different elements within the nebula. Most nebulae are composed of about 90% hydrogen, 10% helium, and 0.1% heavy elements such as carbon, nitrogen, magnesium, potassium, calcium, iron. These clouds of matter are also quite large. In fact, they are among the largest objects in the galaxy. Many of them are dozens or even hundreds of light-years across. Nebulae have been divided into five major categories. These are emission nebulae, reflection nebulae, dark nebulae, planetary nebulae, and supernova remnants. Emission and reflection nebulae tend to be fuzzy in appearance and lack any noticeable shape or structure. They are also known as diffuse nebulae. Emission Nebula - An emission nebula is a cloud of high temperature gas. 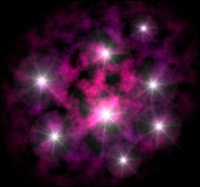 Within this type of nebula, a star energizes the atoms in the cloud with ultraviolet radiation. As these atoms fall back to lower energy states, they emit radiation. The process is similar to that of a neon light. This causes the nebula to glow. Emission nebulae tend to be red in color because of the abundance of hydrogen. Additional colors, such as blue and green, can be produced by the atoms of other elements, but hydrogen is almost always the most abundant. A fine example of an emission nebula is the Orion Nebula (M42). Reflection Nebula - A reflection nebula differs from an emission nebula in does not emit radiation of its own. It is a cloud of dust and gas that reflects the light energy from a nearby star or group of stars. Reflection nebulae are frequently the sites of star formation. They usually tend to be blue in color because of the way that the light is scattered. Blue light is scattered more efficiently. The Trifid Nebula (M20) in Sagittarius is a good example of a reflection nebula. Dark Nebula - A dark nebula is a cloud of dust that blocks the light from objects behind it. They are very similar to reflection nebulae in composition and look different primarily because of the placement of the light source. Dark nebulae are usually seen together with emission and reflection nebulae. The Horsehead Nebula in Orion is probably the most famous example of a dark nebula. It is a dark region of dust in the shape of a horse's head that blocks the light from a much larger emission nebula behind it. Planetary Nebula - A planetary nebula is a shell of gas produced by a star as it nears the end of its life cycle. Their name can be a bit misleading. They actually have nothing to do with planets. These nebulae were given this name because they often look like planets due to their round shape. The outer shell of gas is usually illuminated by the remains of the star at its center. The Ring Nebula (M57) in Lyra is one of the best examples of a planetary nebula. Supernova Remnant - Supernova remnants are created when a star ends it life in a massive explosion known as a supernova. The explosion blows a large amount of the star's matter out into space. This cloud of matter glows with the remains of the star that created it. One of the best examples of a supernova remnant is the crab Nebula (M1) in Taurus. It is illuminated by a pulsar which was created by the supernova. Nebulae are often the sites of star formation. In fact, all stars, planets, and solar systems are formed from nebulae. A nebula may lie undisturbed for many millions or billions of years as it waits for just the right conditions. Eventually, the gravity from a passing star or the shock wave from a nearby supernova explosion may cause swirls and ripples within the cloud. Matter begins to coalesce into clumps and grow in size. As these clumps get larger, their gravity increases. Gravity continues to pull in matter from the nebula until one or more of the clumps reach critical mass. The clumps are forming protostars. As gravity squeezes even tighter, the core temperature eventually reaches 18 million degrees. At this point, nuclear fusion begins and a star is born. The solar wind from the star will eventually blow away all of the excess dust and gas. Sometimes other smaller clumps of matter around the star may form planets. This is the beginning of a new solar system. Several nebulae have been found to be stellar nurseries. The Eagle Nebula, and the Orion Nebula are both sites of active star formation. There are a few nebulae that can be seen with the naked eye and many more that can be detected with a good pair of binoculars. A telescope is required to bring our fine details. Unfortunately, the human eye is not sensitive enough to bring out the rich colors of most nebulae. It is the photograph that does the most justice to these incredible objects. Until recently, time exposures on film were the best way to bring a nebula's true colors. Today, digital photography has simplified the process. New tools like the Hubble space telescope are giving us views of nebulae that have never been seen before. Areas of active star formation have been identified in many galaxies that were once thought to be inert. 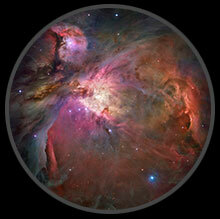 Perhaps the most well known nebulae is the Orion Nebula, also known as M42. It is one of the very few that can be seen with the naked eye. It is a bright emission nebula over 30 light-years in diameter. The nebula is illuminated by a group of stars at its center known as the trapezium. Another popular favorite is the Lagoon Nebula, M8. It is much larger than the Orion Nebula, reaching over 150 light-years across the heavens. The Trifid Nebula, M20, is one of the most colorful. This reflection nebula contains a combination of elements that render it in rich hues of red, blue, and pink. Dark lanes of dust divide it into three distinct parts, giving rise to its name. One of the most famous planetary nebulae is the Ring Nebula, M57. This is a beautiful object that resembles a circular rainbow around a small central star. Another popular planetary nebula is the Dumbbell Nebula, M27. Its unmistakable bow tie shape gives it its name. The Crab Nebula, M1, is probably the best known supernova remnant. It is a shell of gas expelled by a supernova explosion. 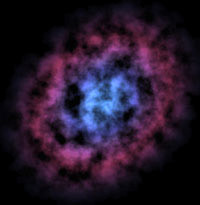 The nebula is illuminated by the 16th magnitude star remnant at its center. The Hubble space telescope has captured some breathtaking images of nebulae from all parts of the galaxy. If you are interested in seeing them, visit some of the Hubble sights listed in the Sky Links section of this site.